The Joint Standing Committee was established to inquire into and report on the rollout of the National Broadband Network (NBN). View ASCA’s submission. 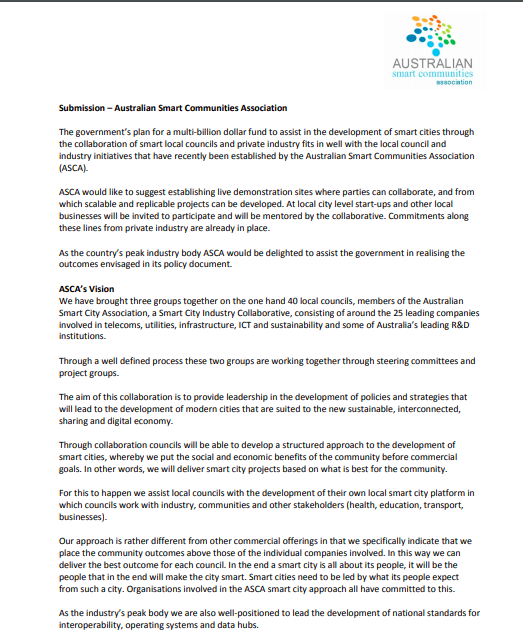 The government’s plan for a multi-billion dollar fund to assist in the development of smart cities through the collaboration of smart local councils and private industry fits in well with the local council and industry initiatives that have recently been established by the Australian Smart Communities Association (ASCA). View ASCA's submission letter. This Bill proposes to implement, in part, the Government's response to the independent cost-benefit analysis and review of regulatory arrangements for the NBN. This Bill contains measures that respond to recommendations made by the Vertigan panel (headed by Dr Michael Vertigan AC) to fine-tune the operation of the telecommunications access regime and NBN Co's line of business obligations. ASCA’s submission supports all measures that encourage competition for service providers, the ability for NBN to conduct pilots/trials and the opening up of interconnection to listed points on the National Broadband Network (NBN). View ASCA's submission letter.